This short document has been prepared by Brendon Baillod in 2008 to record the pertinent historical data about the Sikora family that emigrated from Poznan, Poland to Milwaukee, Wisconsin about 1886. I’ve included as complete as possible a picture of all descendents of this family. This history consequently, includes many families that most of us have never met or heard of. Over the years of preparing the genealogy, I was surprised at the number of descendents this family has produced. In fact, on more than one occasion when I lived in Milwaukee, I discovered through research that I was related to persons that I had already met through work or social functions, without realizing that they were a cousin. The descendents of Sikora families now number in the hundreds and I’ve captured information on many of them in this history, especially if they were born before 1930. However, I am missing much data for persons born after 1950. It is also important to note that several other Sikora families settled in Milwaukee and are NOT closely related to us. 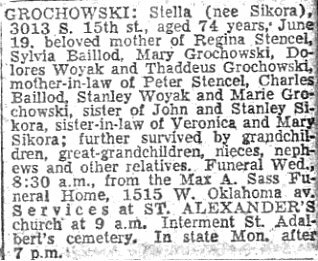 The names are fairly common in Poland and one can find other Milwaukee Sikora families on the US Census that are from other parts of Poland. The information in this history was compiled over a period of 20 years from many different sources, including interviews, newspaper obituaries, US Census data, Church records from many Milwaukee parishes, Civil records from the Milwaukee County Courthouse, Naturalization documents from Federal Court, old City Directories, Cemetery records, ship passenger lists, the Social Security Death Index, and many different online genealogical databases. I have copies of most of the original documents such as marriage licenses, death certificates, birth records, obituaries, etc., that were referenced and would be happy to make copies for anyone who wishes to see them. This information has also been entered into a genealogical database which I placed on the internet several years ago at Ancestry.com and Rootsweb.com. Names and dates for living persons do not appear in the online version of the database. I would be happy to share electronic copies of the database with any family members who request them. I would also appreciate updates from family members regarding births, deaths and corrections to any errors. In addition to the above data, several years ago I also placed short narrative history of the Sikora family online at baillod.com. I was subsequently contacted by many family members and distant cousins who found the site and provided information for this family history. It is my hope that this history supplies interesting information for your family and provides an important sense of identity in our increasingly generic American culture. The surname Sikora is derived from a Polish word for the Titmouse bird. This name does not have any noble connotations but is very common in Poland to this day. The Sikora families of interest to this discussion originate in the province of Poznan, Poland. The families identified “Posen” as their place of origin on the US Census and on other civil records. The families most likely were referring to the Province of Posen, rather than the City. Posen is the German name for Poznan, which is the historic cradle of the Polish state and is one of the richest and most developed areas of the country. It was an early center of learning, religion, international trade and culture, beginning around 900 AD. Poznan was a very cosmopolitan area and many different ethnic groups settled there, including many Jews. However, beginning in the late 1700s, Poland was partitioned and taken over by powerful neighboring countries. Poznan became part of Prussia and was subjected to German colonization. In 1871, Germany gained formal control of Prussia and began a program of forced Germanization of the Poles. Many Poles were displaced from their homes by German colonists, and Poles were forced to adopt German names and culture. 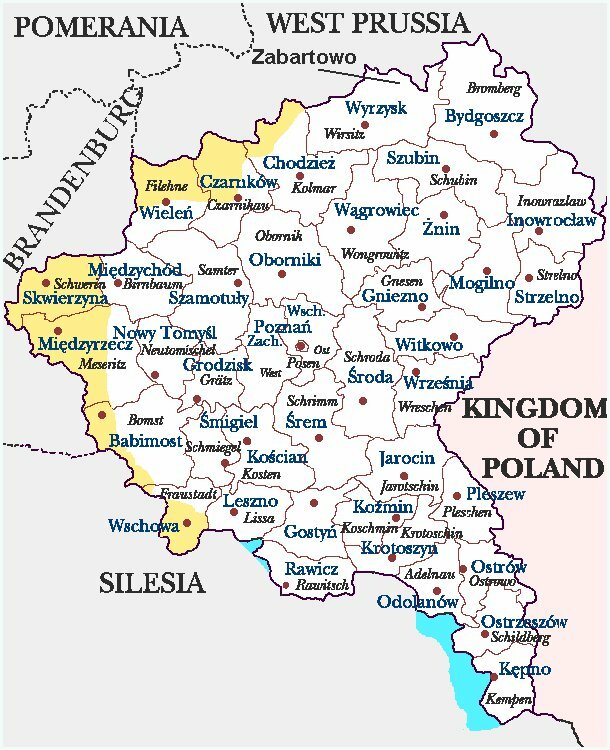 Many Polish towns were renamed and Polish landowners lost their holdings. Church records in Poland point to the feudal village of Zabartowo in the District of Wyrzysk in northern Poznan as the place of origin for our Sikora family. People of the Zabartowo area were principally involved in sheep herding and agriculture. Zabartowo is a very old village dating back to the 1300s. For most of Poznan’s Poles, life was difficult long before the start of Germanization. Much of the population of Poznan were rural farm workers and laborers. Like most Poles, they were heavily Roman Catholic and lived a nearly feudal existence in which they were legally bound to the landowner on whose property they lived. They engaged in meager subsistence agriculture and produced crops of wheat and wool for their landowners who were often foreigners. It was a hard existence where disease and famine regularly wiped out entire generations and ethnic and nationalistic feelings often erupted into violence. It was from this background that most of America’s Poles came in the period 1871 – 1900. Many were leaving to avoid conscription into the German Army, while others wished to retain their Polish culture. Others were fleeing the feudal rural society in search of a better life. Many had run afoul of German officials. All had saved money for many years for the opportunity to escape a difficult life with poor prospects for the future. Often, large families would pool their money to send one member to America in hopes that they would earn enough to bring the rest of the family over. Upon arrival in the US, the Poles were generally counted as Germans because Poland had ceased to exist. For naturalization purposes, the Poles had to renounce loyalty to the German Emperor because there was no longer a Polish state. Many Poles had also been forced or chose to take German last names. As such, the actual number of Polish immigrants to the US has generally been dramatically underestimated and in the case of Milwaukee’s German immigrants, a substantial number were actually ethnic Poles. Little is known about our Sikora family in Poland. They were almost certainly rural Polish peasants, living in the small villages of the Wyrzysk district of northern Poznan. However, we do know a few interesting facts about our Sikora family in Poland. Michalina Sikora, the eldest daughter of Jozef and Katarzyna Sikora is shown on the Zabartowo marriage index at the online Poznan Marriage Index Project database. She married Frank Grzybowski at Zabartowo in 1876. It is consequently, believed that our Sikora family originates in this area. To date, the remaining civil records of Zabartowo have not been transcribed, but several Sikora families can be found in the area. Fortunately for Poznan’s Poles, the German occupiers had no objection to their leaving. Poles consequently left Poznan in droves between 1871 and 1920. The main impediment to leaving was money. Few Poles could earn enough money to purchase a ticket to America and Polish landowners were not eager to see their free labor force depart, often erecting obstacles to leaving. The cost for a steerage class ticket on a transatlantic steamer in 1890 was about $20, which was a year’s wages for the average Polish peasant, but for most Poles, the ticket included train passage to their destination as well. The principal ports of embarkation for Poles were Hamburg, Antwerp and Bremen, which were a few hundred miles from Poznan by train. The immigrant ships of the 1880s and 90s were not glamorous. They were large steamships, often with wooden hulls and upper decks geared toward first class passengers, with the rest of the ship reserved for steerage passengers. Steerage passengers were generally housed below deck in common areas with bunks and a common mess area. After several days journey by train or carriage to the coast, the passengers boarded and set up housekeeping for the two week passage from Europe to the US. Almost all passengers were seasick within a few hours of leaving port. The misery generally persisted for a few days until they got their sea-legs. 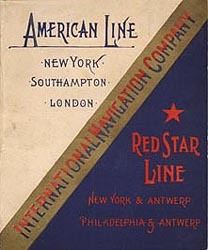 On board ship, the passengers would compare notes on what they had heard about America and exchanged advice on living in America. Sometimes, families from specific villages would travel together. The ships generally landed at New York, Baltimore or Philadelphia. Baltimore was a favorite among Polish passengers because of the city’s reputation for providing aid to Catholic immigrants and the ready availability of work. Baltimore was also popular because of an agreement between German steamship lines and the Baltimore & Ohio Railroad that allowed passengers to purchase one ticket for both the ship and train passage to their destination. The Sikoras left Europe through the Port of Bremen, Germany in early April of 1886 and after a brief stop at Liverpool, England, they boarded the Red Star line steamer SS Illinois for the trip across the Atlantic. They arrived in the US through the port of Philadelphia on April 26, 1886. The family included Jozef, age 61, Katarzyna, age 53, Anton, age 25, Francisca, age 14, Joseph, age 11, John, age 11, Tekla, age 9, Anna, age 7, Stanislaus, age 5 and Stanislawa, age 3. The family appears on the manifest of the Steamship Illinois in the Port of Philadelphia Passenger Lists. Despite the primitive and often filthy conditions on the ships, all the Sikoras survived and made it to America. Upon arriving in Philadelphia, the Sikoras immediately went by train to Milwaukee where they likely had friends or acquaintances. 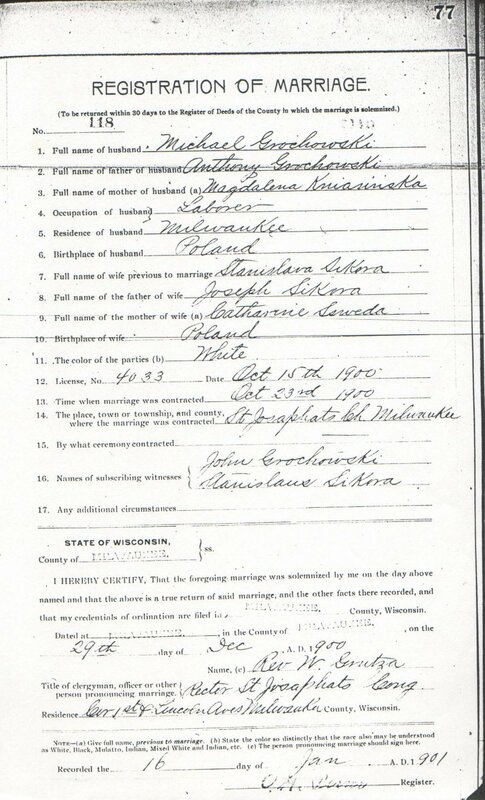 Naturalization documents for the Sikora men that immigrated are in the collection at the Milwaukee County Historical Society confirming that they arrived at Philadelphia in April of 1886. There is evidence that the Sikoras knew other Milwaukee Polish families that had already made the journey. Once in Milwaukee the Sikoras became intermarried with the Czaplewski family, who were also from Prussia and may have been from the same area of Poznan. The Sikora family had at least three adult children who did not emigrate with them. Daughter Michalina Sikora emigrated with her husband Frank Grzybowski and children in 1887, daughter Josephine emigrated with her husband Teofil Labecki in 1880 and Daughter Elizabeth Sikora emigrated in 1883, apparently with her fiancé Joseph Szot. The two were married in Milwaukee on July 23rd, 1883. The marriage certificate lists Elizabeth’s parents as Jozef Sikora and Katarzyna Szweda. When the Sikoras arrived in Milwaukee in 1886, they almost certainly knew people who had emigrated earlier. Poles had been coming to Milwaukee for almost 30 years and a large Polish community was already in place on Milwaukee’s south side. It was consequently, not necessary to speak English in order to find work. By 1890, they had settled at 1011 Grove St. (now S. 5th St). The Sikoras lived there with the Czaplewski family which they would marry into several times. They attended St. Stanislaus Church on 5th and Mitchell St as well as St. Josaphat's on 6th and Lincoln and St. Hyacinth's on 14th and Becher. Almost all of the men in the family worked in the iron industry. They were teamsters in the iron foundries as well as moulders and ironworkers. The women also worked. Many of them worked as dressmakers and knitters in the garment industry on the South Side. The National Knitting Company and Phoenix Hosiery employed many of the Sikoras. Jozef and Katarzyna Sikora were already middle aged when they emigrated to the US. Records vary as to the dates of birth of Jozef and Katarzyna. Jozef's tombstone at St. Adalbert's places his birth in 1826, but his death record at the Milwaukee County Courthouse gives his date of birth as June 15, 1837. His stated age on other documents suggest that the 1826 date of birth is the correct one. Katarzyna's Death Record places her birth at November 26, 1845, but US Census data and her age given on the immigrant ship manifest indicate a date closer to 1837. Unfortunately, Katarzyna's grave at St. Adalbert's has no marker to give an additional date. As I went through the archival records of this era, I found that many dates and spellings were inaccurate. This seems to be partly due to the language barrier that probably existed between the early Polish immigrants and the recording officials, and partly due to errors on the part of those reporting the data. It should also be noted that there were as many as four separate Sikora families which emigrated to the South Side of Milwaukee between 1880 and 1900. Only about half of the Sikoras living in Milwaukee today trace back to Jozef and Katarzyna. The Catholic Church became an extremely important social, cultural and religious center for Milwaukee’s Poles. Early Polish Immigrants had founded St. Stanislaus Church on 5th and Mitchell in 1866 and many other Polish churches quickly followed, including St. Hyacinth and St. Josaphat’s where Stanislawa Sikora would marry. The early Sikora family members belonged to St. Stanislaus. Few of Milwaukee’s Polish immigrants maintained ties to the old country, particularly during the 1880s and 1890s. Second generation Milwaukee Poles often reported that the old country was seldom talked about and was not remembered fondly. Milwaukee’s early Poles also avoided discussing what part of Poland they were from, possibly to shed the old nationalistic and ethnic pressures from Poland. In any case, few of Milwaukee’s third generation Poles knew much about their ancestors in Poland or where in Poland their families had come from. Generally, new immigrants stayed with another family when they first arrived and worked until they could rent a house. The 1900 US Census for Milwaukee shows many houses with as many as 25 people living in them, constituting 3 or 4 different families. Around the turn of the century, a Milwaukee Polish household often consisted of one or more grandparents and the entire families of 2 or 3 married adult children. Most families had more than five children and many had upwards of 12 children. After 5 or 10 years of working in Milwaukee, most families could afford to buy a home in Milwaukee’s Polish core and in about 1890, the Sikora family moved to a house at 1011 Grove St. At this time, everyone over age 13 in the household worked to support the family. Still, the 1880s – 1910s were tough times for most Milwaukee Poles. Conditions were much better than those in Poland, but the jobs they did were often menial and dangerous. Wages were low, work hours were long and Milwaukee’s German officials often viewed them with disdain. Many Milwaukee Poles chose to identify themselves as German and even to Germanize their names in order to be more upwardly mobil in Milwaukee society. Jozef and Katarzyna’s daughter Michalina married Frank Grzybowski in Poland in 1876. They left Poland and arrived in Milwaukee around the same time as the rest of the Sikora family. At the time of their immigration, they had two or three young children. Michalina and Frank had 8 children between 1876 ad 1898 including Antonine (1879), Casimir (1883), Stanislawa (1886), Stephen (1889). Frank (1891), Roman (1893), John (1895) and Roman (1898). Michalina died November 10, 1936 and is buried at St. Adalberts Cemetery. The next of Jozef and Katarzyna’s children to marry was Josephine. She married Teofil Labecki (sometimes seen as Labenski) in Poland in about 1880. The couple emigrated to the US shortly after marriage. They settled at 1805 Garden Street and had children Matt (1883), Francisca (1885), Anne (1886), Rose (1888), Boleslaw (1890), Stanislaus (1891), Bronislawa (1894), Frank (1895) and Aloise (1897). Daughter Francisca married Casimir Kasprzak about 1905 and had children Anton, Alice (Lenzen) and Hilda (Datka). Today, Hilda Datka’s headstone at St.Adalbert’s Cemetery marks the resting place of Hilda Kasprzak Datka, her mother Francisca Labecki Kasprzak, Hilda’s grandmother, Josephine Sikora Labecki and Hilda’s great grandmother, Katarzyna Szweda Sikora. The next of Jozef and Katarzyna’s children to marry in the US was Elisabeth Sikora. She married Joseph Szot in July 1883 at Milwaukee and had children Mary (1885), Frank (1890), Laura (1892), Edward (1893), Paulina (1897) and Joseph (1899). Joseph Szot died before 1900, and the family moved in with Elisabeth’s sister Francisca. The family Germanized its last name to Schott by 1900 and Elisabeth lived with her children and worked as a laundress until her death on May 1, 1937. The next of Jozef and Katarzyna's children to marry was Francisca Sikora. She married Anton Borzych on February 6, 1888 at St. Stanislaus Church. (Milw. Cty. Marriage Rec.) The Borzych family would grow to include Peter (1888), Joseph (1890), Anton (1891), John (1894) and Paul (1896). Although many of the children died young, this family remains in the Milwaukee area to the present day, and consequently, many Borzych's are 2nd and 3rd Cousins. The Borzych family settled at 433 Smith St., very near the family of Francisca’s sister, Tekla, and Anton worked as an Iron Molder. Francisca’s husband Anton died in 1904 from alcoholism and she remarried Frank Kozak in 1909. Francisca died in 1912 and is buried at St. Adalberts Cemetery. The next of the children to marry was Tekla Sikora. She married Albert Kordus on January 13, 1890 at St. Josaphat's Church. Albert was born in Poznan, Poland in 1866. The Korduses settled at 1065 1st Ave. in Milwaukee and Albert worked as an Iron Moulder. By 1891 they had their first child, Leon Kordus. Subsequent children were Martha in 1894, Edward, 1895, Magdalene in 1897, Emil in 1898, Clemens in 1907, Harry in 1909, Esther (who later married Frank Banach) in 1913 and Henry Kordus in 1919. 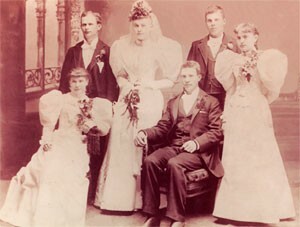 Descendants of this family can also be found throughout the Milwaukee area to this day. In September of 1890, Anton Sikora married Katarzyna Wierzba at St. Stanislaus' Church. They moved in with Katarzyna's family at 511 Maple St. Anton worked as a teamster in a washer factory and soon bought the house from the Wierzba family. It is interesting to note that on the 1910 Census, 24 people were living in the house at 511 Maple St., comprising five different families. In later years, Anton's mother came to live with the family and died at the house. In 1893 Anton and Katarzyna had their first child, John Sikora. Next was Frank in 1894, Anton Jr. in 1896, Stanislaus in 1897, Paul in 1899, Julia (Sikora) Kenitz in 1901, Martin in 1905, Harry Sikora in 1907, Felicia in 1910 and Catharine (Sikora) Chmielewski (who married Frank Chmielewski), in 1912. Most Sikoras remaining in the Milwaukee area descend from this family. 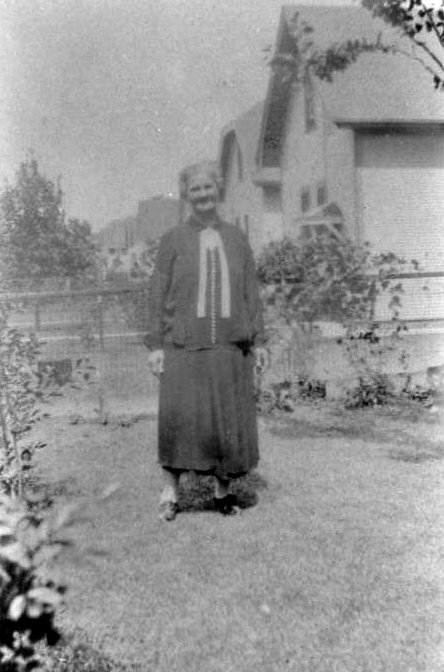 The family of Anton Sikora was close with the family of Michael Grochowski and Michael’s daughter Magdalena Grochowski lived with them in 1920. On October 24th, 1892, Joseph Sikora married Amielia Grzybowski at St. Josaphat's on 6th and Lincoln. They settled at 1018 Garden St. (now S. 5th St.) and Joseph began to work as an Iron Moulder at Harvestor Foundry. This family had 5 Children. In October of 1895 they had Roman Sikora, in April of 1897, John Sikora, in January of 1899, Emil Sikora, in 1901, Henry Sikora and in 1905 Josephine Sikora. 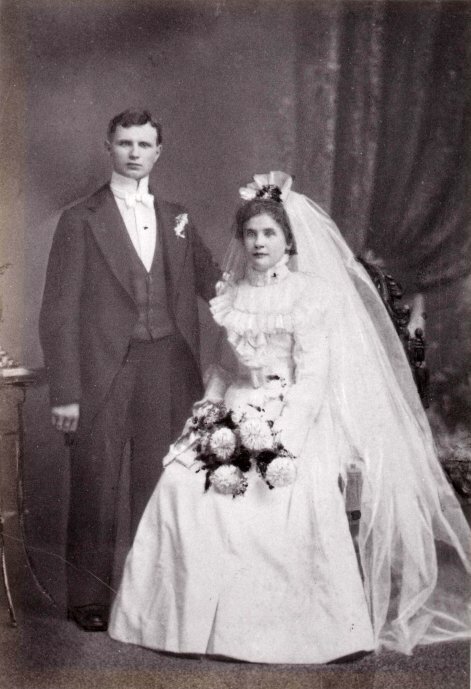 Anna Sikora married Joseph Czaplewski on February 19, 1895 at St. Josaphat's. They settled at 1018 Garden St. and Joseph began work as an Iron Moulder in the Foundries on Milwaukee's South Side. The Czaplewski's had three children; John in 1896, Mary in 1898 and Helen in 1900. On September 12, 1907 Joseph died of alcoholism. After this event, Anna and family moved in with her brother Joseph Sikora Jr. Anna worked as a washwoman and later for the Street Railway Company. 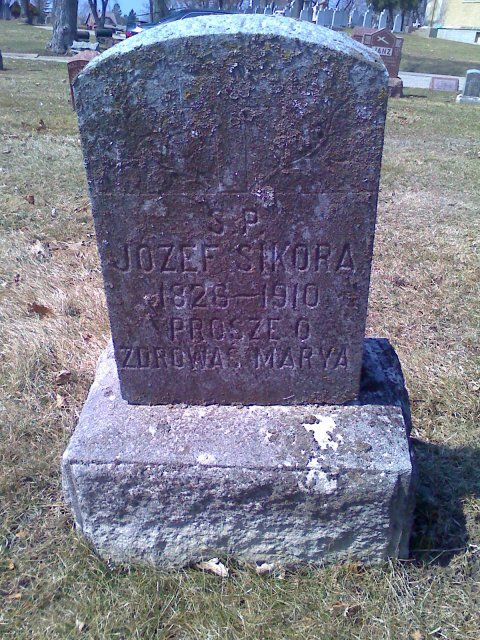 On May 29, 1896, John S. Sikora married Joseph Czaplewski's sister Veronica Czaplewski at St. Josaphat’s. Veronica was born in May of 1877 in Poznan. John began work as an Iron Moulder and the family settled at 824 Garden St. and lived over the next 5 years at 1289 2nd Ave and 2623 S. 7th St. They had ten children; Joseph Sikora in 1897, Edward W. in 1899, Ladislaus (Walter) J. in 1902, Johanna in 1904 (deceased 1915), Irene (Sikora) Jablonski in 1906, John Sikora Jr. on June 14, 1909, Raymond Sikora on August 29, 1912, Margaret (Sikora) Meyer in 1915, Veronica (Sikora) Potocky in 1917 and her twin sister Esther at the same time. These families also have MANY children and grandchildren living in the Milwaukee area at present. Stanislaus Sikora was the last of the men to marry on September 9, 1903. He married Mary Kasprsyk who was born in Poland in 1880. Stanislaus and Mary settled at 980 10th Avenue in Milwaukee and Stanislaus went to work as an Iron Moulder as well. By 1940 the family lived at 2059 S. 16th St. They had eight children. Irene was born in 1905, Helen in 1907, Alois in 1908, Emily in 1911, Martha T. in 1915, Edward in 1917, Ervin S. in 1919 and Ralph in 1920. Stanislaus died in 1955 and Mary died in 1962, both in Milwaukee. The last to marry was Stanislawa or Stella Sikora. She married Michael Grochowski on October 23rd 1900 at St. Josaphat's. Michael's sister Francisca Grochowski had married Joseph and Veronica Czaplewski's brother John Czaplewski. Subsequently, Michael met Stanislawa to whom he was already heavily in-lawed while he was working as a foreman at the National Knitting Company. Michael and Stanislawa had a number of children, including Helen Grochowski (1901), Eva Regina Grochowski (1903), Magdalene Grochowski (1905), Sylvia Catherine Grochowski (1907), Tadeus Stanley Grochowski (1908), Josephina Grochowski (1911), Mary Grochowski (1912), Felecita Grochowski (1915), Delores Grochowski (1921) and other children who died as infants. (These individuals are buried at St. Adalbert's Cemetery in Section 12, Block 7 in unmarked graves.) Michael and Stella first lived at 1013 Grove St. (now S. 5th St.) in 1905 and Michael worked at the National Knitting Company at 889 Clinton St. (now South 1st St.). By 1910, Michael and Stella had moved to 1010 6th Ave. (now S. 11th St.) where they rented. By 1920 the family had bought their home at 3055 South 15th St.
Jozef Sikora, the family patriarch, worked as a glove maker in his later years and died at his home on 1011 Grove St. on July 31, 1909 at the age of 83. He is buried at St. Adalbert’s in Block: 12, Row: 6, Grave: 3. Katarzyna (Katherine) Sikora died September 11, 1919 at the home of her son Anton at the age of 83. She is buried at St Adalbert’s in Section: J, Block: 2, Lot: 16n2 next to her daughter Josephine. The period 1920 – 1970 was an important transitional one for Milwaukee’s Polish immigrants. The first generation of immigrants had passed away and the second generation were aging. The most pronounced change during this period was the migration of Milwaukee Poles out of the old neighborhoods around Mitchell and Lincoln into newer neighborhoods to the south and west. During this time, Michael and Stella moved to 1159 1st Ave. (now S. 6th St.), and were living there in 1920, but by 1925, they had moved to 3013 S. 15th St.. A large contingent of the Sikora families settled around 15th and Oklahoma Ave., while others moved to Bay View, South Milwaukee, the Town of Lake, and later to Greenfield, Hales Corners, Waukesha and other suburbs. The driving factors behind the migration were education, prosperity and congestion. The old neighborhoods had older homes and a high population concentration. As the second and third generation became educated and literate, they tended to get better jobs. Michael Grochowski, who had started working in the hosiery shops in the 1890s had become a foreman and could afford a new home of his own outside the old Polish core. Many other Sikora descendents followed suit and few of them lived in the old neighborhoods by 1930. After WWII, education played a major factor in the upward mobility of Milwaukee’s Poles. The Polish Catholic church had a strong history of promoting education, and Milwaukee’s parochial schools sent many fourth generation Poles to colleges and universities. Others participated in Milwaukee’s postwar industrial boom and did well for themselves as skilled laborers, often unionized. Many Grochowskis and Sikoras worked as Machinists, Mechanics, Machine Operators and other skilled industrial occupations during this period. The Catholic Church continued to be very important for Milwaukee Poles and remained an important center for social, cultural and community events as well as education. The Sikoras of the 1930s – 70s were generally affiliated with the newer churches outside the Polish core. Our Grochowski and Sikora descendent families are now generally in their 6th generation since immigrating. Few if any family members are still living who personally met or remember anyone from the 1st generation, and the 2nd generation is rapidly passing into memory. Most of the 3rd generation descendents are no longer with us and the 4rth generation is rapidly graying. It is consequently, important that we pause at this juncture to record our history, while those who remember it are still with us. Family members are now distributed across the US, although many remain in Wisconsin. Few of the 4th generation families have regular contact with each other and most recall each other only from family gatherings in the 1950s. Very few 5th generation descendents have ever met one of their second cousins. This reunion is consequently, a good opportunity to meet some of the people we’ve heard our parents and grandparents reminiscing about. It is also a good opportunity to share our remembrances, make new friends and to record family information for our descendents. Few of us beyond the 3rd generation can still lay claim to being 100% Polish, but most of us still have been exposed to significant aspects of the Polish Milwaukee culture. Many of us from the 4th and 5th generations still prepare an occasional Polish dish and we still know the meaning of a few Polish words. However, for most of the family members born after 1980, our Polish roots will be known primarily through anecdotal information. If you get a chance, take the time to see some of the old homes where our ancestors lived. Visit the old churches, neighborhoods and cemeteries. Milwaukee’s old Polish neighborhoods around Mitchell and Lincoln still retain a great deal of their original immigrant character and are now the home to many new immigrant families. I recall that when I located many of the old homes of our ancestors, I was astounded at how small they seemed for the 2 or 3 large families that sometimes lived together in them during the 1890s. It was interesting to note during my visits in the 1990s, that the homes were once again occupied by 2 or 3 large immigrant families and that despite the passage of over 100 years and the changes in technology, the area still had a tangible, even palpable sense of what life was like for our Polish ancestors. The following linked database includes all the descendents of the Sikora families that I have located to date. The data is far more complete for those branches of the family that have contacted me and shared information. In most cases, I have complete dates and places of birth, marriage and death, but did not include them here in the interest of space. A family tree with complete information is available online at http://wc.rootsweb.com/cgi-bin/igm.cgi?op=GET&db=2188007&id=I0495 but does not include first names or dates for living persons.